Whose bright idea was it to stack Warfs single-file to form a ladder, and how do they even stay stuck together at the odd angles, velcro? There has to be a better way of getting Kadoaties down from mile-high tree branches like, oh, I don't know, NEOPETS WITH WINGS?! What is the invisible pet really like? 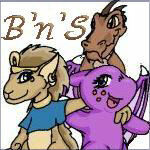 Well, lucky for you, I'm here with the inside scoop on the bothersome little fiends. Today I will be walking around, and hopefully I'm going to trip and fall on my face. Well, I mean, over an invisible pet. How else am I going to find one? You have any better ideas? There was no distracting her at this time. Bored, the Eyrie left the room, happy to depart the hot room. Lea stayed, engrossed in her rather long book. When she was done, it vanished, just as all Neopian books do. The Shoyru stood up. Suddenly a thought hit her. Why do books vanish when you read them? "Stripes, you see, has been sneaking out every night to do something suspicious, and none of my traps have ever stopped or snagged him in his process. And you add it on to the fact that he always brings that shovel with him..."
Will No One Think of the Petpets? It's no small wonder why the Petpet Protection League was formed, but what are they really doing to stop the rampant petpet abuse in Neopia? 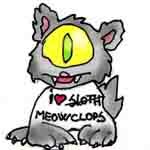 The Neopet who finally defeated the evil monster, Sloth!